O khasam - O my Lord master Waheguru, vaahu - You are amazing! All hail to You! thoo vaahu - You are amazing, all hail to You, I bow down to You! Jin rach rachanaa ham keeeae - You rach - create rachanaa - this universe, all of the worlds, all of the planets, all of the beings, ham keeeae - You created us. Saagar - all of the many water, lehar - the many waves, samundh - the many oceans, sar - the many pools, vael - all of the plants in the world, varas - all of the clouds, varaahu - all of the mountains. Everywhere has been created by You Waheguru, You are the Creator. Aap kharrovehi - You stand in all of the beings, aap means Himself, Waheguru Himself is standing in every single being, aap kar - You are the One who created everyone, You are standing within everyone, You are sitting inside each and every one of us. Aapeenai aapaahu - You Yourself have created all of this and You stand amongst all of this. Aapaahu also means to not be afflicted by any type of dirt. Although Waheguru jee is sitting within each and every one of us but Waheguru remains pure and immaculate. Aapaahu - means immaculate, without any blemishes. Those who keep the Guru in the center of their lives their saeva - their service thaae pavai - is always rewarded, is always accounted for. Ounaman thath kamaahu - they live their lives in the state of complete realization, thath kamaahu - they are living out the essence of life. For them majooreeaa - the hard work, the effort that they've put in, to meditate upon the Naam, to get up in the amritvela to read gurbani, for that masakath - for that hard work they've put in they get the majooreeaa - meaning the fruits of their hard work. What is the fruit of that? 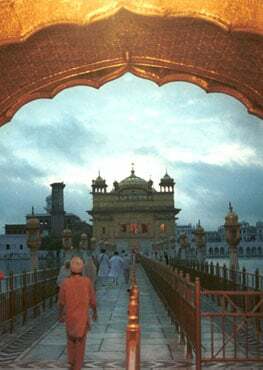 Mang mang khasam dharaahu - from the dharaahu - from the door of their master, of Waheguru mang mang - they can ask for whatever they want. Gurmukh piaareyo in Gurbaani we can see the bhagats asking God lovingly: Gopaal thaeraa aarathaa | jo jan thumaree bhagath karanthae thin kae kaaj savaarathaa - Bhagat Dhanna jee is asking God, dhaal seedhaa maago gheeo | - I ask for dhal. hamaraa khusee karai nith jeeo | panaeeaa shaadhan neekaa | anaaj mago sath see kaa |1| - I need enough food to get me through the seven days of the week, to keep me going. If we ask Bhagat Kabeer jee, Bhagat Kabeer jee says, bhookhae bhagath n keejai | - if I am hungry I cannot meditate upon You. Yeh maalaa apanee leejai. When we ask Bhagat Kabeer jee what are you asking these things for? Bhagat Kabeerjee says mai naahee keethaa labo | eik naao thaeraa mai fabo | - I am only aksing for these things so that I may meditate upon Your Name. So Guru piaareyo whatever they ask for they get but they do not ask for anything in greed or desire. They ask for only what they need. Sathiguru Sahibjee says that dhar - that court of the Lord is always pur - always completely perfect and is vaeparavaah - is carefree. The courts of the world may be influenced by money, may be influenced by many other things but the court of God is only influenced through True Love and Devotion. Tho dhar oonaa naahi ko - at Your dhar - at Your door oonaa naahi ko - no one leaves without anything, everybody leaves with something, no one goes empty handed. Sachaa vaeparavaahu - You are the True Lord Waheguru, You are carefree. Oujal means pure, mothee means pearls. The teeth in our mouth are beautiful sohanae, oujal pure, mothee - pearls. Rathanaa naal jurrann - our eyes are like rathanaa - are like diamonds jurrann - attached to our faces, embedded in our face. But Sathiguru Sahibjee reminds us the vairee - the enemy of them is old age. As old age comes eye sight starts going, the teeth start going loose and they fall out. J butae theee marann - they waste away as we get older. Even before this body is afflicted by death, even before death comes the eye sight start becoming less and less and sometimes all of the teeth fall out. So Guramukh piaareyo Guru Sahibjee is telling us to wake up to the reality and if we wake up to this reality what shall we do? Do not get depressed that everything is passing away instead har saalaahee sadhaa sadhaa - forever and forever saalaahee - meditate upon Hari, meditate upon Waheguru. than man soup sareer - give your than - your physical body and your man - your spiritual body, all of your sareer - everything that is yours, soup - dedicate it to the Guru. Through the Guru's Word's you'll find sach - you'll find Truth; you'll find the true point of life because sachaa gehir ganbheer - because Waheguru is sachaa - forever true, gehir - the most profound and ganbheer - is the unfathomable. You cannot know the end of Waheguru. Those people who meditate upon the Guru's shabad, man than - in their mind, in their body, hirdhai - in their heart, rav rehiaa - Waheguru jee is pervading through all of them. Har heeraa heer - the diamond of all diamonds, the heeraa heer - is the Hari Waheguru. If you have Waheguru in your heart, mind, body and soul, janam maran ka dhukh gaeiaa - the pain of being born and dying, coming again and again in the cycle of rebirth is gaeiaa - is removed. Fir pavai n feer - they never go into the feer - the cycle of rebirth. Sathiguru Sahibjee says meditate, salaahi thoo, on the name of God. Har gunee geheer - Waheguru is the ocean, Waheguru is overflowing with virtues. How are you going to dip into these virtues? By meditating upon Waheguru jee's virtues, those virtues will come and abide within You.